As I said, this issue picks up where Alpha #1 left off, and it tells of what happened with Captain Britain and Death’s Head II after the climax of this issue. Mys-Tech is involved of course, and everything revolves around neutralising Britain’s greatest heroes and building up a significant army of Psycho-Wraiths before the organisation can make its move. We saw part of this in Dark Angel #1 and Knights of Pendragon #1 as well, so its not a surprise all that much that we are still in the set up phase for Revolutionary War. The pieces are still being moved on the board, and everything is being brought together for what promises to be quite an explosive finish. But how exactly does Death’s Head II fit into all of this, that’s the question. He is a time-traveling mercenary and little more. He goes where the money is, where a good fight is. That’s all he is concerned about really. He doesn’t exactly have a moral compass, although he is loyal to his friends, and even to his own original self, Death’s Head. This issue explores both characters and it does a fairly decent job of showing who both these two characters are, what their differences are, what their similarities are. But, the supporting cast is rather weak in comparison. Tuck gets little to no screen-time and there’s almost no development. Dr. Necker, one of the antagonists of this issue, is cliched and boring, in the Sunday morning cartoon villain style, and this was disappointing. There is a lot of humour packed into this issue, but the problem is that the humour never really clicks. And with Necker being so boringly cliched, things are even worse off for those involved. I personally could not help but cringe at every bit of her dialogue here. And there did seem to be a bit of a silly macguffin in this issue with regards to how the bad guys are beaten by the good guys. I was expecting things to go a certain way, and I’m glad that they didn’t, but the final few pages felt rather dreary to me. There was just nothing in them that, well, clicked for me, and that’s a shame since I think this issue had some really good potential in that regard. On the art side, we have Nick Roche as the penciller with Veronica Gandini as the colourist and VC’s Clayton Cowles as the letterer. And we have Mark Brooks on that excellent cover, which has Death’s Head fighting Death’s Head II in a really cinematic action type of way that I like and enjoy. The pencils in this issue were decent. Not great, not bad, just decent. The problem mainly was that often the panels got really cluttered and it was also hard to make out just what was happening with regards to the action, especially in the second half. Everything just blended together. Part of the problem was also that the colours were so non-distinct at times, that is the two Death’s Heads often looked similar in a way. This is also a negative for the colours of course. Gandini does some excellent work overall, but in a few panels it all falls flat. Not quite the issue I was looking for, certainly, but a decent one nonetheless. The primary value is that it has some great humour and advances the meta-story of the Revolutionary War. More Revolutionary War: Alpha #1, Dark Angel #1, Knights of Pendragon #1. 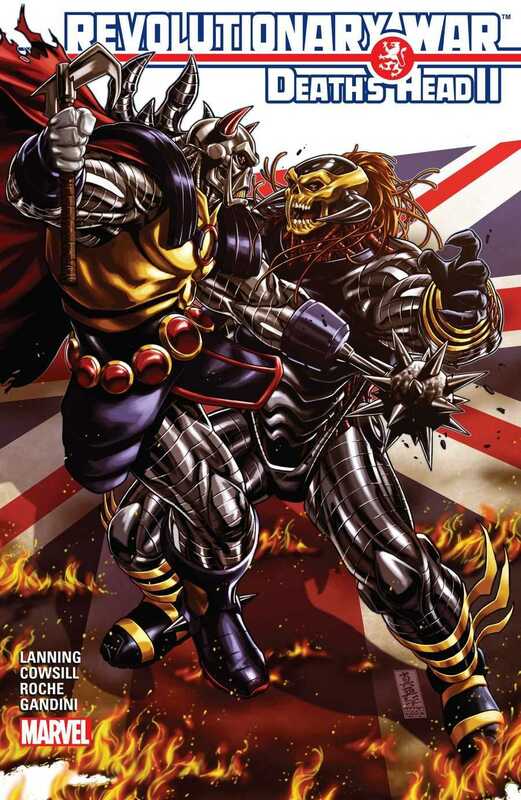 Posted on February 16, 2014, in Comics Reviews, Review Central and tagged British Superheroes, Captain Britain, Comics, Comics Review, Death's Head, Death's Head II, Marvel Comics, Marvel UK, Mys-Tech, Review, Review Central, Revolutionary War, Revolutionary War: Alpha, Revolutionary War: Dark Angel, Revolutionary War: Death's Head II, Superheroes, Supervillains, Time Travel, VC's Clayton Cowles. Bookmark the permalink. 5 Comments.